Writing a blog is by and large a solitary activity, and social media, paradoxically, can be anything but. But lately I’ve had the pleasure of becoming, dare I say it, part of a community. It’s a loosely-bound, organic kind of community, but a community nonetheless. In a time when it’s commonly assumed we’re all living nutso, hectic, increasingly isolated lives, with the breakdown of family values, declining influence of religion, lack of moral fibre and increasing technologification (not a word) of daily life, I find this quite heartening. So I thought I’d take a break from writing about food and coffee today and turn instead to the food blogging community. Most people can spot a faker from a mile off. I know I can, especially if what you’re faking is my bread and butter. It’s hard to have genuine interactions with people who are liars. But not only that. Say you want to become part of a community based on an interest in… nail polish. You want to really *love* nail polish. To death. Because everything you do in that community will be defined by nail polish. We see this all the time in cults. If you don’t want to drink the kool aid, you have to leave the cult. Your bible study group won’t have much to say to you if you stop reading the bible. I dread to think what I’d do with friends if I stopped drinking coffee. Senhor R and I have often turned to each other and said ‘What would you do with someone who didn’t love food? What would you talk to them about? How could you be in a relationship with them?” That’s it. Right there. That’s why I’m a food blogger and not a nail polish blogger. This goes hand in hand with the genuine interest thing, because if you aren’t obsessed with something, how the hell are you going to be part of a community based on it for years to come? But more importantly, it takes time to make yourself known. In the case of blogging, no one’s really going to read you that much at first. On social media, conversations, building up rapport, all that stuff – that can’t just suddenly happen. Even meeting people you’ve chatted to online can be weird and awkward, you may not get on. You may not ever meet. But when you’re present – online, at events, wherever, you’ll be seeing the same faces and names popping up over and over again, and yours will be too. This is a really important point. I’m not saying you’re not going to meet your BFF food blogging or bible studying or nail polishing – you very well just might. But I am saying that it doesn’t matter if you don’t, and that being your aim is…lame. Because an interest-based community is by definition, based around an interest, it’s fine to meet your community just for dinner, or bible study, or nail polishing, or things related to or based around that. Anything else is just icing on the cake and not everyone’s a fan of icing (or so I’m told). The aim of the game is not to make friends by having an interest. Pursuing that interest is the aim in and of itself. Why become part of something? Study after study has shown that being part of the herd makes us want to kill ourselves a little less. It gives our lives meaning, we feel connected. Note I’m not encouraging you to join a clique, with rigid rules, a reluctance to let in new people and a tendency to shun those who don’t follow protocol. I’m talking about a group where people come together to do something, together, that they are interested in, and that gives them a feeling of purpose. But the main reason to become part of a community is IT’S FUN! And yes that warrants caps and an exclamation point. Are you part of an interest-based community (or as I am now calling it, an IBC)? What’s been your experience? It may not happen often, meeting up with my IBC, but when it does it feels comfortable. Yes there are likewise people out there and sharing time together, away from the computer, is pretty humbling. I love that you used my acronym. And I agree. ‘Comfortable’ is exactly the right word. Great post. I am a food blogger and am loving it. I think respect is a big word. Great post. I enjoy the sense of community around food blogging. I like that it’s not a solo hobby, that I can meet up with people, share a bite to eat & chat about food, glorious food. Like you said though, sometimes meeting strangers can be awkward…I like the big group catch ups – less pressure that way. It’s how I got to meet you, so it can only be a good thing, right? The Perth Foodie community has been nothing but welcoming, gracious and helpful. It’s made my favourite thing 1000 times better, because I’m with people who GET IT. Who don’t think I’m crazy. It’s a beautiful thing. eatmeetswest recently posted…Cake Club. Where it’s at. Can I just say, I felt so welcome when I came to visit Perth, it was an amazing couple of days. And I love that we can travel around and visit each other like it’s no big deal. But it is a big deal! It’s fantastic! Lovely commentary on a topic much greater than people outside the bubble give it credit. It is lovely to have a pocket of people who, for lack of a better term, ‘just get it’! Love this post! I am slowly joining the IBC community of food bloggers as a relative newbie to the scene. Making ‘adult friends’ unconnected to your world of uni/work/boyfriends is tricky and twitter has helped make new connections. Although we may not be BFFs with matching friendship bracelets (yet), it’s nice to meet so many cool peeps that don’t judge me for taking photos of food before wolfing it and discussing its finer points. Everyone bands together for the common goal of helping those who are less fortunate, and it’s a great way to meet new neighbors and connect with old ones..
Another great post. I guess besides the sense of community, pursuing an interest with passion also helps with keeping your sanity. I like this a lot – I’ve been waiting for an article like this to turn up in my RSS feed. Confession: sometimes (because of my staggering inability to update my food blog) I don’t feel like I’m a “proper” part of this community. But when I attempt to insert myself into events (read: such as inviting myself to the #BurgerParty via Twitter), I’m usually welcomed openly. Food bloggers are such nice folk! R, you are totally a part of the blogging community. You are one of the first bloggers I met I’m sure…you love food, we love food – it kinda doesn’t matter when a person updates their blog or not. It’s all about a shared interest. Who would’ve thought when I started meeting bloggers that I’d be going to their weddings or that a couple of them would become my closest friends? When I first started, there weren’t as many of us and only a handful were slowly starting to emerge out of the shadows and taking the plunge of meeting face to face. Back then it was also quite different because twitter was still new so we got to know each other a little differently. So much has happened in the last few years! Well said, great post! I am loving all the new blogger pals I am making, it’s stacks of fun. It’s great meeting people with a similar interest and it’s a brilliant way to feel a huge sense of understanding & belonging. I really enjoy your posts… You explain the bigger picture of blogging so well. I enjoy the sense of community around food blogging. I like that it’s not a solo hobby, that I can meet up with people, share a bite to eat & chat about food, glorious food. I’ve only just returned to Sydney after living overseas for three years and I’m so excited to meet some of the lovely food bloggers whose writing I’ve been following for ages. I agree, people do things and join a community primarily because it is fun! Oh, the Food Blogging Community? From the photos, one could be excused for thinking you’d joined the Chinese/Vietnamese (or east-asian) Community. Research & write a post on why the food blogging community is top-heavy with east-asians, when their numbers Australia wide are less than 1-in-20 of the population! Your questions, for me, only prompt further questions. Depends what you mean by ‘east Asian’. Do you mean people born in the Eastern parts of Asia? Or whose’ parents were? Or who are of East Asian appearance? Or who self-identify as ‘east Asian’? About 1/3 of us, for example, identify as Australian by ancestry. What does that mean? What does an ‘Australian’ person look like? Could they not possibly look ‘east Asian’ to you or me? In response to your question as to “why the food blogging community is top-heavy with east-Asians” vs. the overall racial/cultural profile of Australia, I don’t know that it necessarily is or isn’t the case. 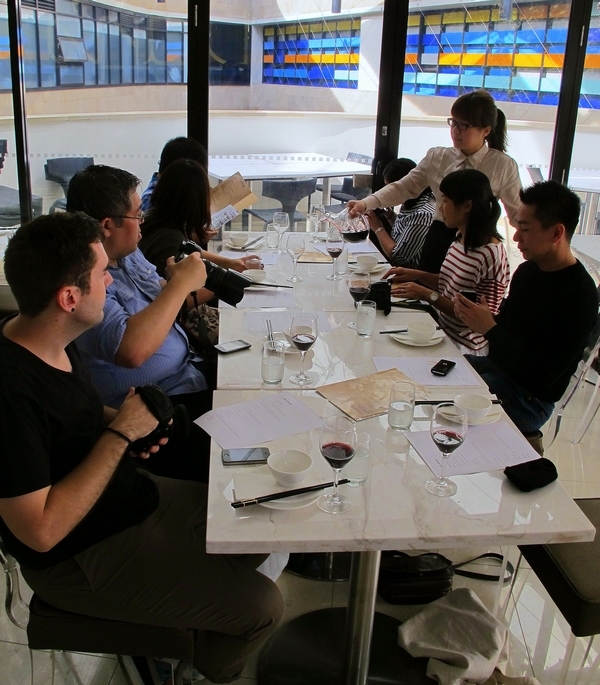 I haven’t done a survey, it could be that there are more food bloggers of ‘east Asian’ appearance in Sydney… or at events… or in my photos… or who I’ve met. Why does it matter? It seems like you’re trying to get at something here, and I’m not sure I like it. You take a series of photos of a group of amateur writers. The photos are mostly of orientals, in a land that is mostly anglo-saxon, and you “don’t like” it when someone notices and makes an observation on this anomaly? On the surface of it such a group should be pretty much representative of Australian-born inner-city urbanites. Thus the anomaly stands out. It is not as if it is (say) a meeting of an online “mandarin language” discussion group. One would have to completely devoid of observation skills to not ponder where are the anglo-saxons. Why do you “not like” this? Surely you don’t hang around exclusively with people who are either (a) too dumb to notice their surroundings, or (b) aren’t well travelled enough to realise there are many breeds/brands of people in this world? Steve at the Pub recently posted…Guilty – unless proven Guilty! ‘Orientals’? Really? That’s a pretty disparaging term. I’d try to avoid it if I were you. Ditto for referring to people as ‘breeds’ or ‘brands’. I’m not sure why you assume a a bunch of photos of some Sydney food blogging events would be ‘representative of Australian-born inner-city urbanites’, and as I said before, who’s to say these pictures aren’t? Maybe they don’t represent what you think that demographic looks like. I have eyes. I can see what people look like. But I’m not sure how it’s relevant in this case, and I’m completely entitled to say so in the comments section of my own blog. What don’t I like about your comment? To me, you are not just observing that many people in the pictures are of Asian appearance. You’re saying that there *has* to be some reason lots of food bloggers are Asian, right? Some story behind it, some justification. You’re saying that this needs to be ‘researched’ or ‘investigated’, because if everyone in these pictures was anglo, that wouldn’t be worth investigating, that would just be ‘normal’? I published your comments. But I disagree with them. I wrote a post about communities – why it’s great to be part of one. The fact that the people in my community don’t look quite the same as the people in your community? That’s irrelevant to me. Hmm.. You’ve missed the point entirely. My apologies. I always assume people who can write have the ability to think critically. Sometimes they don’t. My mistake! Tip: Not everything is “heavy with messages” and hidden meanings. Often an observation like: You’re in a country that is predominantly anglo-saxon, yet this series of photos shows very few of them, means: well, means exactly that. Sorry for not realising you are a deadly serious person caught up in some sort of uptight “thou must not notice chinese-looking people look, you know, chinese” frame of mind. Sort of like having a series of photos taken at somewhere named “(something) Hills”, but without a hill in sight. “Orientals” is a disparaging term? Erm… Que?? It is not only a spanish absorbtion into English, but it has been a word in the English language for a long time. I take it you don’t read classics? One thing makes me rather curious, what on earth gave you the idea that people in my community look different to the people in your photos? “I always assume people who can write have the ability to think critically.” That’s what I’m doing, and yet you seem to take issue with that. “You’re in a country that is predominantly anglo-saxon, yet this series of photos shows very few of them.” Ok, let’s say that really is what you mean. So what? I’m also in a country that is predominantly desert. Are you commenting on the fact that I’m not in a desert? My point has nothing to do with noticing or not noticing the relative ‘chinese-ness’ of a group. I just question (you know, using my critical thinking skills and all) whether the ‘chinese-ness’ of that group has anything to do with…well, anything. In this context, yes I think ‘Orientals’ is generally considered an outdated, disparaging term. We are not reading the classics here, ni estabamos hablando en espanol. ‘Oriental’ is a word used to describe a vase, not a person. The reason I assume the people in my community must look different than the people in yours is that if they did, I doubt you’d think the ethnic makeup of the Sydney Food Blogging Community warrants comment. But that’s just an assumption. Maybe this could be the start of your PHD. People aren’t vases. They aren’t hills. Commenting on someone’s ethnicity or appearance is not the same as commenting on a landscape. Lady, you’ve shown no sign whatsoever of having critical thinking skills (just an aside). You do quite well actually, better than most. (Being as you exhibit many of the test signs of Downs Syndrome.) (i.e. unable to make rational thought connections). And you sir have completely missed the point of my post by making such an irrelevant comment in the first place. Even though I rarely meet up with other food bloggers or attend various events, I like the online interaction we share. As you say, it’s nice to be part of a community of like-minded people. I found it bizarre also. I missed the picnic and the food blog conference which were both shortly after I started FSI. So kind of felt like I wasn’t part of the community yet. (But would once I met some people.) But then… Twitter! All of a sudden I was reading bloggers’ conversations, then I joined in, and then I invited myself to the #burgerparty and things are gaining momentum with more meetups happening soon. Interesting to note that two of the highest traffic referrers to my blog are other bloggers. I saw some research recently which showed that food bloggers are the ones most likely to read and comment on other food blogs. Which really makes sense as we all have much the same interests. Great post, Lauren. I’m coming up to a year blogging and I can’t believe how much it has changed my life in terms of the friendships I’ve made and the work opportunities it’s helped to create. I still remember the thrill of walking into the Australian Food Bloggers Conference last year November and being in a room full of people that loved writing, photography, food and blogging. I felt like I had found my tribe. Keep these excellent posts, coming, Lauren! Ahahaha oh man. Just catching up on some old posts and this one is great Lau. But seriously, did some guy say that “you’ve shown no sign whatsoever of having critical thinking skills” and follow it up with a WINKY FACE and then say that you “exhibit many of the test signs of Downs Syndrome”?! You’re a bigger person than most for approving those comments. 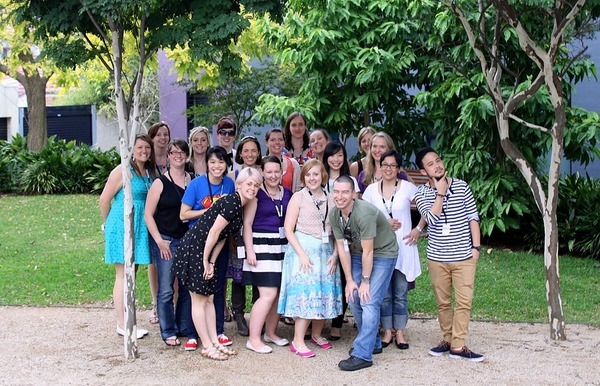 I have always admired what a welcoming and generous bunch the Sydney food blogging community is.